John came to live in the Highlands of Scotland in 1968 to work with the celebrated author and naturalist, Gavin Maxwell, of Ring of Bright Water fame. After Maxwell’s sudden death in 1969, John decided to commemorate Gavin's work and writing by finishing the story of the Maxwell otters. This first book, published in 1972, is called The White Island. The success of this book led to the creation of the first Field Studies Centre for the Highlands and Islands. Since then, over 25,000 adults and 100,000 children have passed through the welcoming doors of Aigas Field Centre. In recent years the environmental education for schools programme independently run by the Aigas Trust (set up by John in 1980) has become the Highlands’ principal provider, handling some 5,000 school children every year. In his best-seller, Song of the Rolling Earth (2003) now in its 10th reprint, and its sequel, Nature’s Child (2004), John celebrates his passion for nature and wildlife. These books have been widely acclaimed; they were followed in 2010 by At The Water's Edge and by Gods of the Morning, published in March 2015. 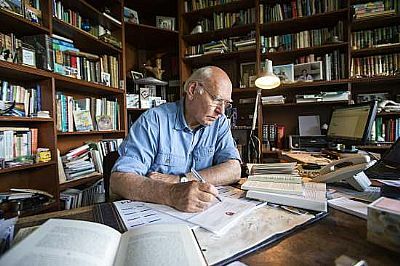 In 2001 John was awarded an OBE for services to nature conservation, and he has received honorary doctorates from two Scottish universities for his contribution to nature writing. In 2016, he was awarded the inaugural Writer's Prize by the Richard Jefferies Society for "Gods of the Morning" which was published in 2015. In the same year, John was awarded the Royal Scottish Geographical Society's Geddes Award for services to conservation, and made an honorary FRSGS. His latest book, The Dun Cow Rib, was published in August 2017 in hardback and the paperback version was published in June 2018. This book was short listed for the Wainwright Prize 2018, and is now available as an audiobook and audio CD. In November, John received a Lifetime Achievement Award in the RSPB's Nature of Scotland's award ceremony in Edinburgh.